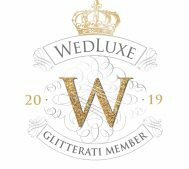 Creating Bespoke & Beautiful Designer Weddings – We believe in true love stories, and we pride ourselves on truly understanding you and your visions. 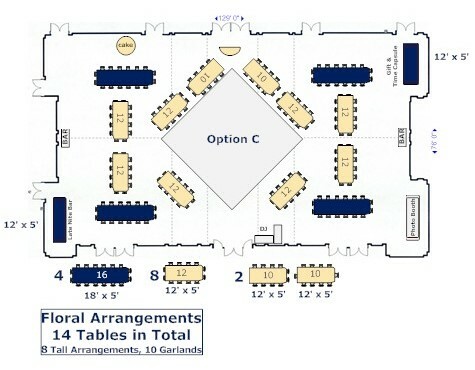 While the un-traditional seating plan format worked well for Nicole and Frank – as it might for any couple throwing a very small reception – for brides and grooms that have larger families, and/or plan to invite a diverse guest list of friends and colleagues who have never met, it probably wouldn’t work so well. The last thing you want at your wedding is people wandering around aimlessly, not committing to a particular seat and not knowing where they fit in (unless you’re doing an hors d’oeuvres-only party with very limited seating, in which case, that is kind of the point). And if you don’t put any thought into who will be seated with whom, or how the room will be arranged, you risk a Seinfeld-like ‘when two worlds collide’ scenario where people who should not be mixing, are seated together or bumping into one another as they try to get their food and drinks. Now for some do’s and don’ts of planning your floor plan. 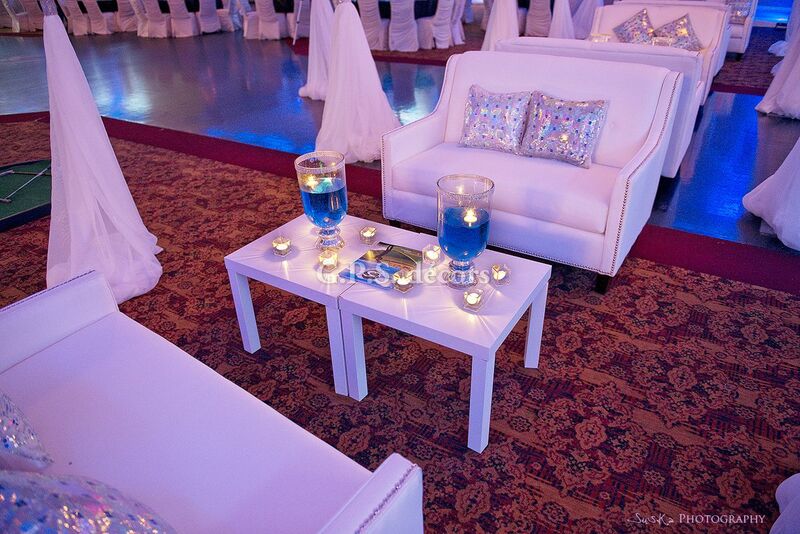 -Leave at least 2 feet around each table so guests can easily slide their chairs in and out. -Make sure every guest is close to something important. For example, a guest should have easy access to the buffet OR be close to the head table OR have an excellent view of the band. -Choose long tables, rather than round, if you’re having a small, intimate reception like Nicole’s. This style brings everyone closer together rather than having a very empty-looking room with scattered clusters of people. -Have a kids’ table if your child guests are 5 and up; they will feel delightfully grown-up eating together and their table can also double as a craft table to keep them occupied during and after the various courses. -Seat lone guests with other singles, not just couples. -Try to cram too many people into a table. If a table seats a maximum of 10 people, take that very seriously – and try to put just 8 people there, if you can. -Put the cake table right in front of the head table, or your guests won’t be able to see the happy couple making toasts or kissing! -Put the cake table too near the dance floor; there is always the risk of it getting accidentally knocked over. -Place elderly relatives too close to the music. Still stumped as to how to achieve the perfect layout? 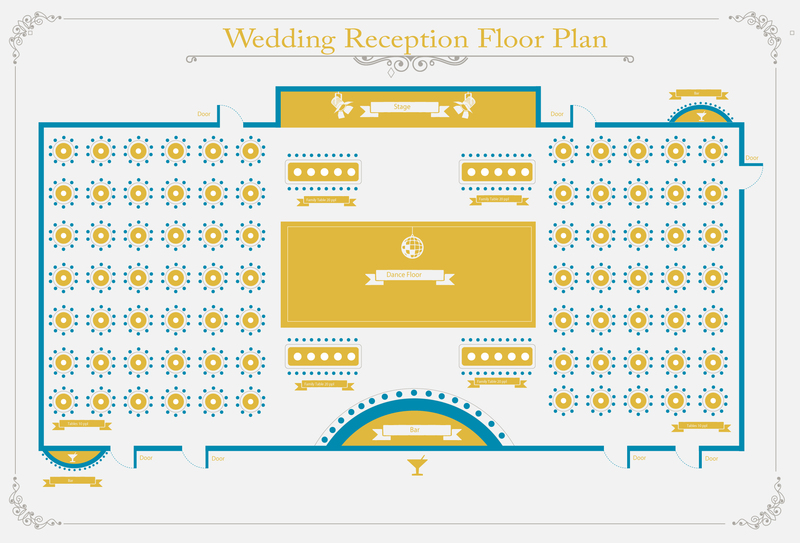 GPS Decors can help you plan a functional wedding reception floor plan that includes everyone and optimizes your space and resources, without the hassle of planning it all yourself. 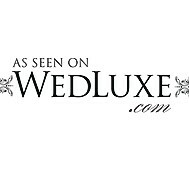 Our deluxe designs are unique, grand, ornate and stylish, making luxurious dreams a reality for brides and grooms. 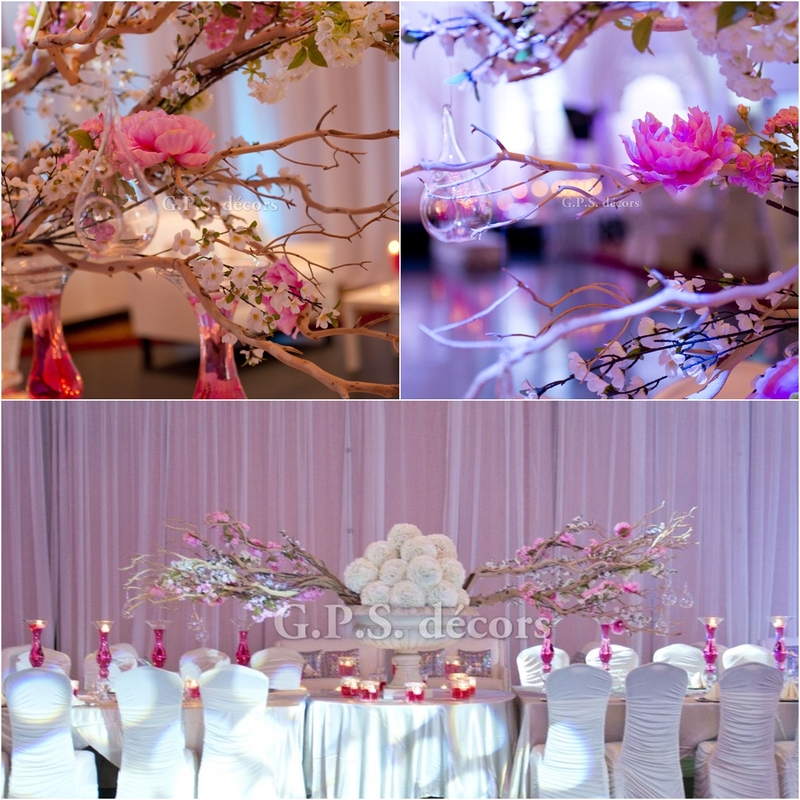 At GPS decors, we design weddings to reflect not only the bride’s style, but also her dreams. 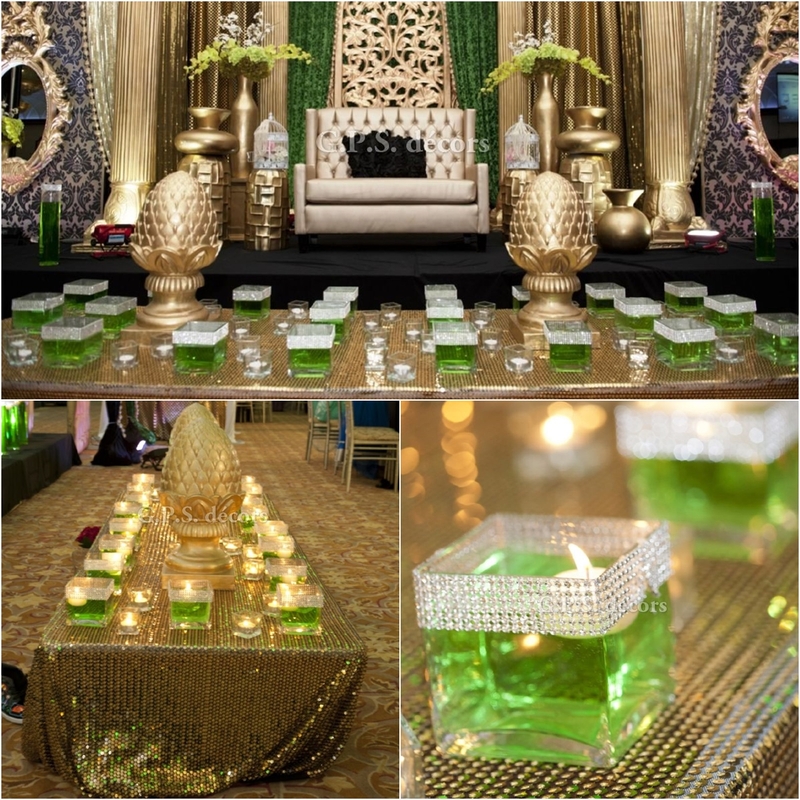 We understand that every bride has a different vision for her wedding, which has led to the creation of the beautiful “Bride in Golden Paradise” theme. 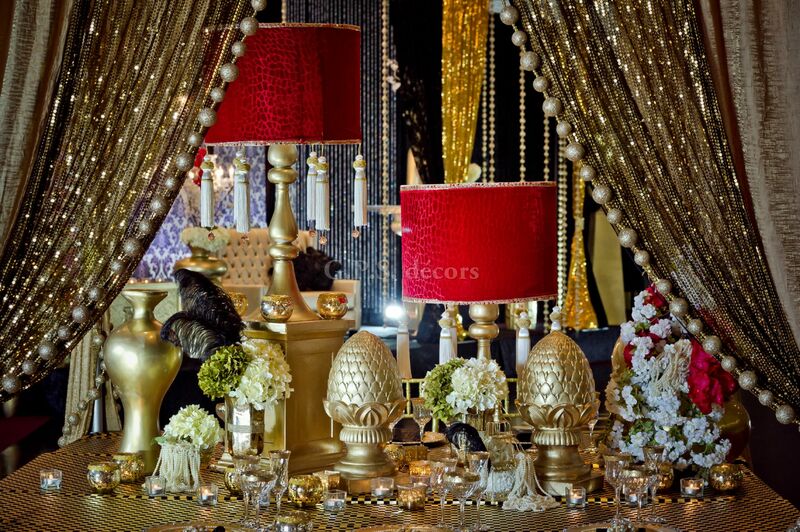 The theme is full of luxurious gold’s that blend with elegant warm hues yet contrast exquisitely against deep blacks. 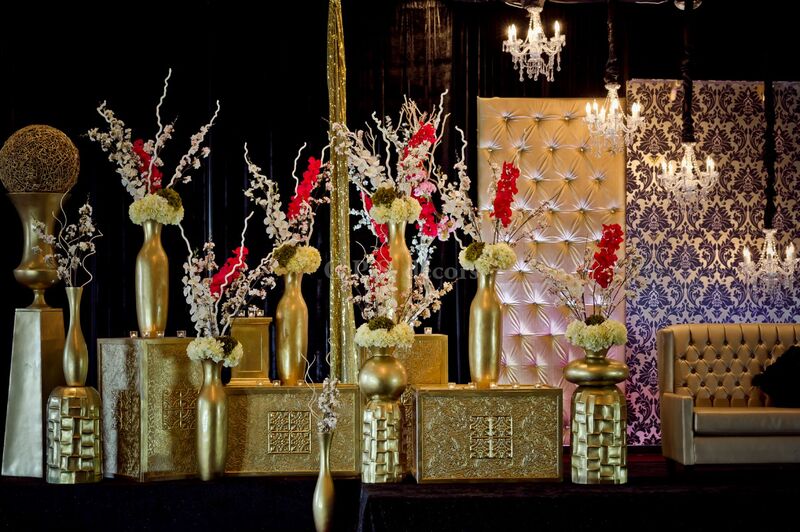 Black and gold can come together to create a breathtaking atmosphere at the wedding, whether used primarily throughout the wedding or just as accents. 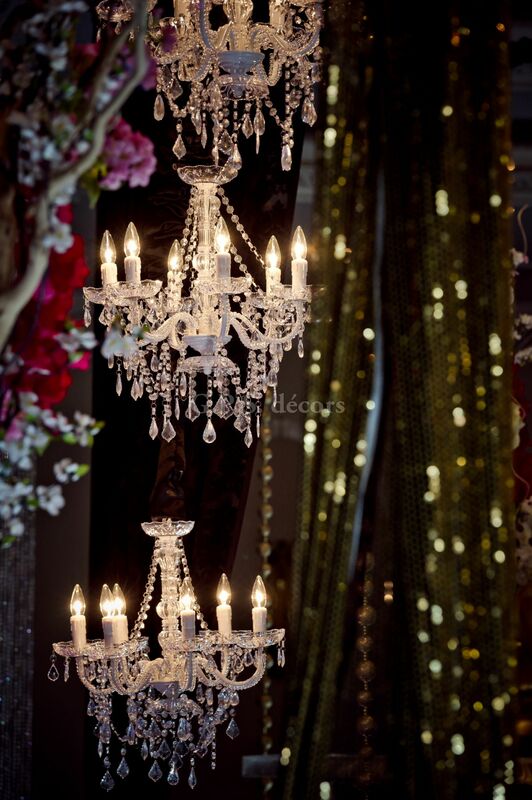 This design takes advantage of the divine warmth of a chandelier, as well as the perfect elegance of a Damask Pattern. 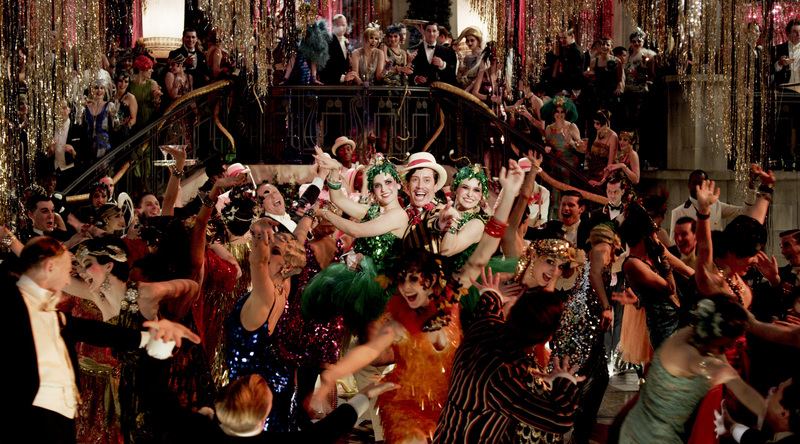 The entire theme revolves around class. It’s elegant, sophisticated, glamorous and grand. 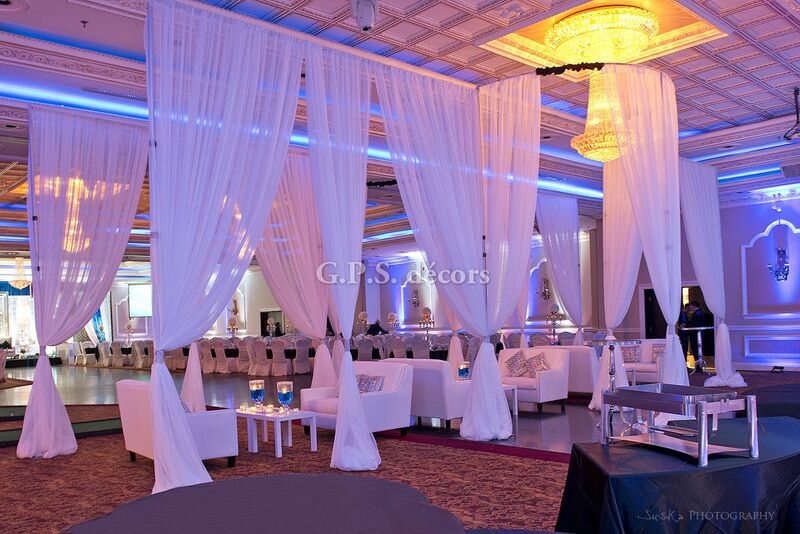 GPS decors designs weddings with features that will add the glitz you want to your big day. Although damask patterns and art deco may look classic or traditional, don’t let it fool you. By working with different, distinctive elements, GPS decors can create a timeless look that compliments your big day perfectly. This amazing stage design will both reflect your lifestyle and add to your enjoyment. 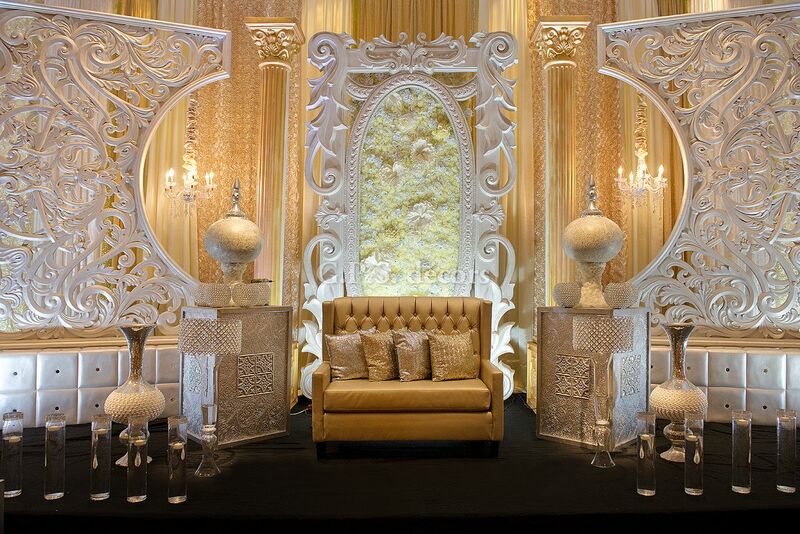 Our beautiful and grand stage design features elegant touches and luxurious elements that even the most particular brides will love. 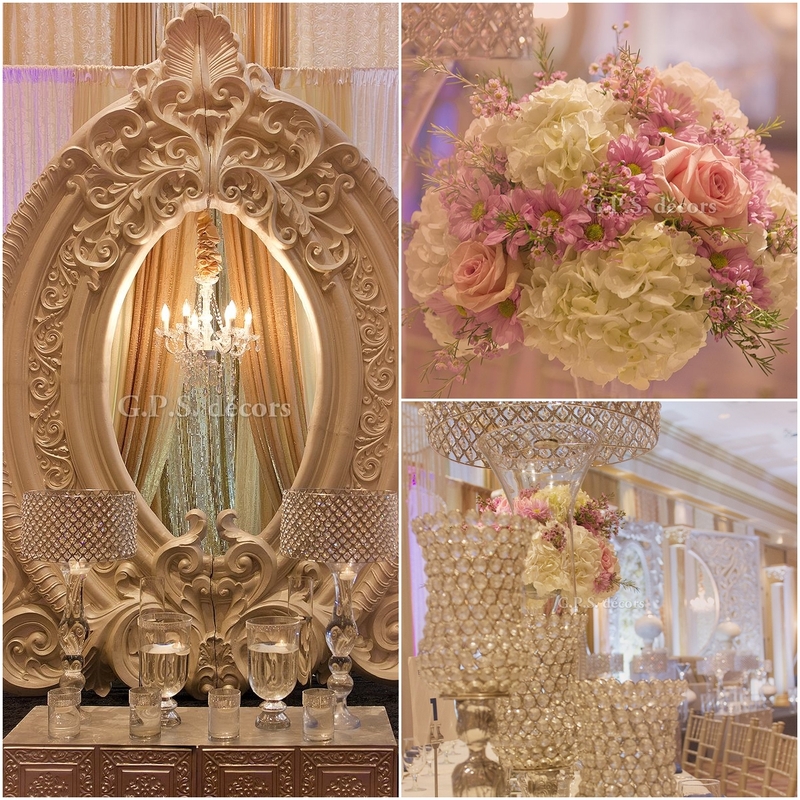 We combine ornate and gracious styles with modern touches, ensuring that you have a truly unique and luxurious wedding backdrop experience. Put it Behind You ! 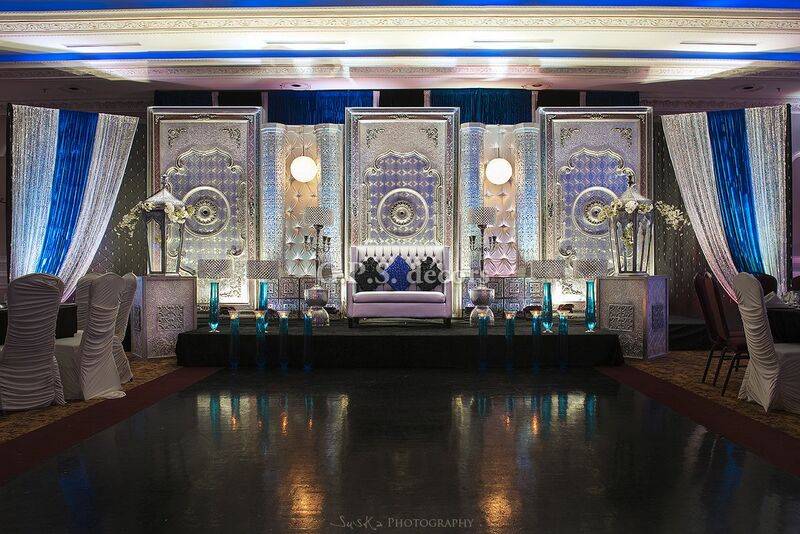 Our beautiful and elegant reception backdrop for Punnam & Manpreet served as the ultimate setting for their perfect day. From the dramatic columns to Victorian frame floral wall each of elements created a stunning backdrop for their wedding reception. 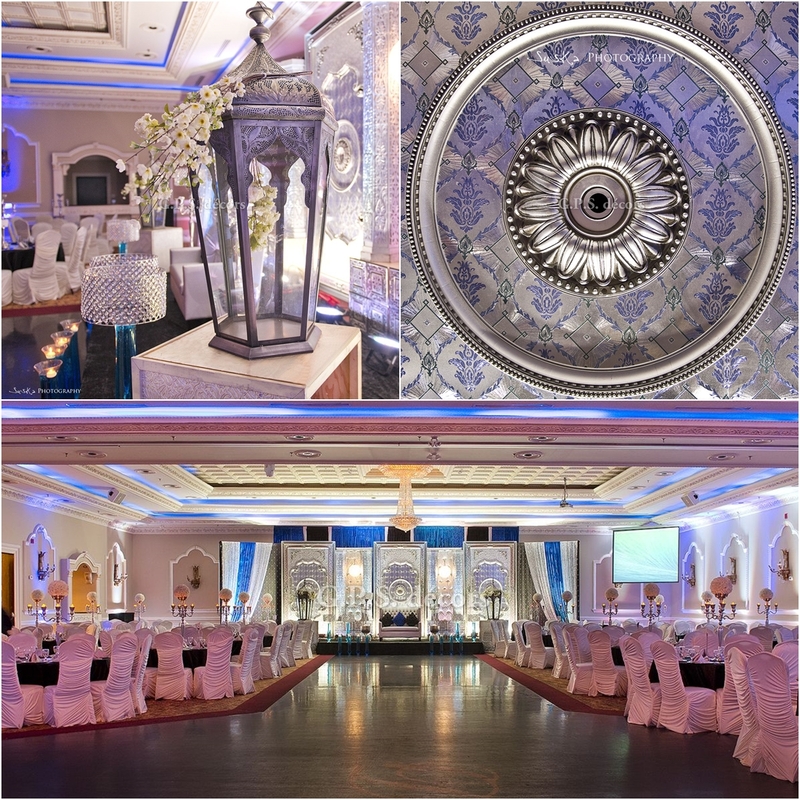 The spectacular décor details on tables left guests speechless. Glamorous Centrepieces with Sparkly Crystals & Fresh Flowers. This sparkling centrepiece stand with beautiful fresh flowers is a stunning accent to Table Decor. 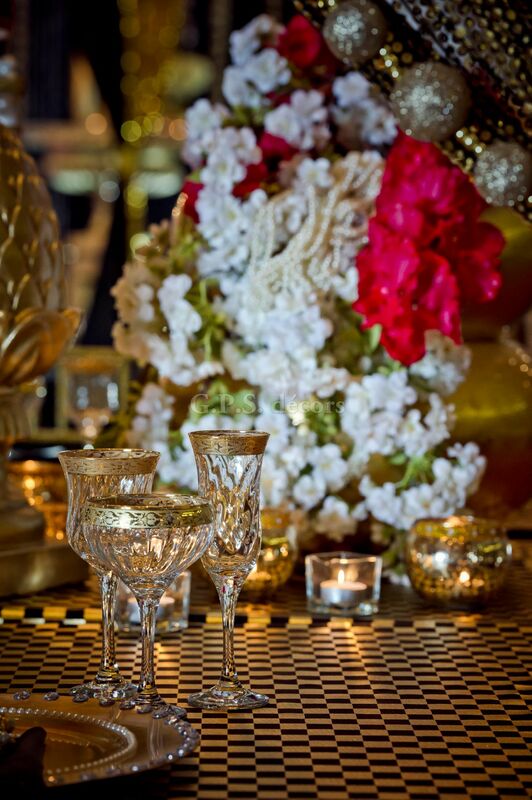 It’s always fun to add a little sparkle to a centrepiece to show off your inner diva. We love these enchanting crystal pieces that bring light to any room. What to Look for in Venue? 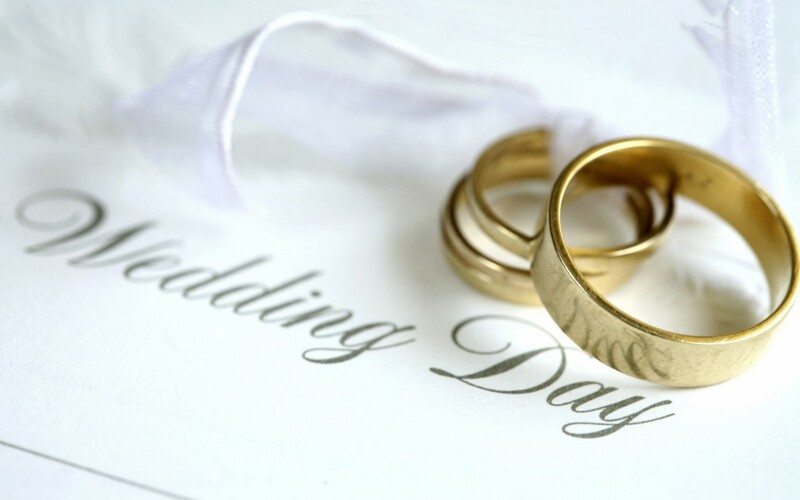 When you are getting married, you may have already chosen the date and the wedding venue. If you haven’t decided where you’re getting married, or where your reception will be, then here are some things you should consider. You’ll want to consider the time of year that you’re getting married, as some venues will look better in summer or winter. You might have reasons for choosing a particular place to get married, or alternatively, you might want to get married somewhere completely different. Perhaps you’ll choose somewhere in the countryside to make an amazing backdrop for your special day. Why not see if the venue you’re considering has a wedding planner, so that they can organise everything, and leave you to get on with the other important aspects of your wedding? If you’re getting married at the venue, rather than a church or registry office, then you might be flexible on the date. If you’re getting married somewhere else, then you’ll need to make sure that your date is available. It’s a good idea to book far in advance, so that you get the date and facilities that you want. 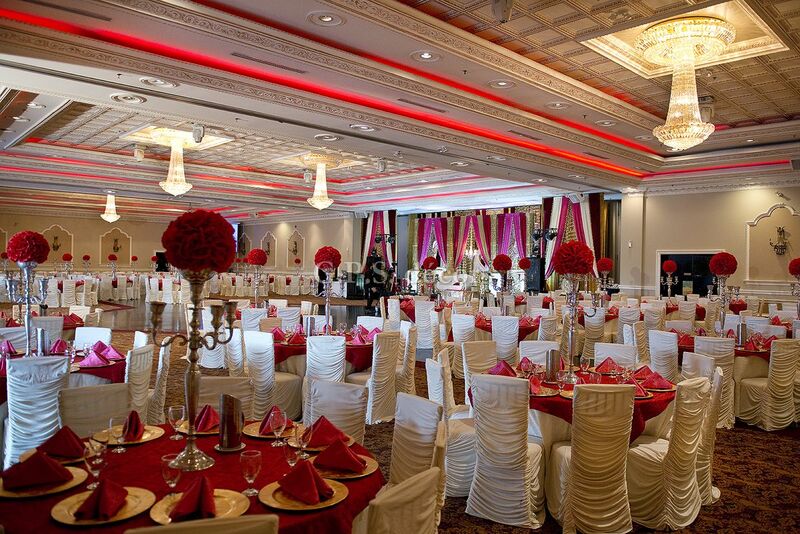 Depending on how many people are coming to your wedding will also help determine what sort of venue you need. You might need a big venue if there are lots of people, or you might prefer a smaller and much moreintimate venue if there aren’t going to be so many people. If you want to have your actual ceremony at your wedding venue, as opposed to just the reception, then you’ll want to make sure that the venue is licensed for weddings. 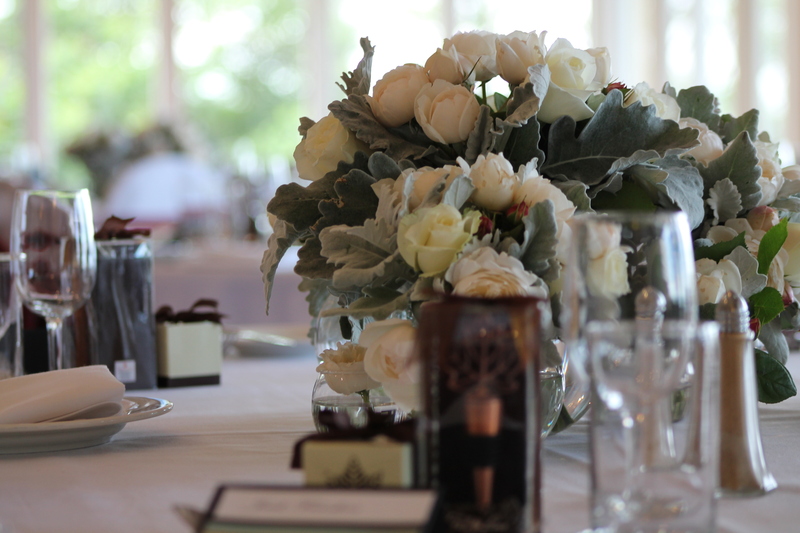 You’ll want to make sure that the wedding venue can do the wedding menu that you want. You wedding meals will be an important part of the reception, so you’ll want them to be right, and suitable for all of your guests. A wedding venue with nice grounds will lend itself to plenty of photo opportunities. If having photographs of your wedding day are important, then you’ll want to pick somewhere with nice scenery and perhaps natural features or impressive buildings. Wedding venue accommodation will be important for you and your guests, so you’ll want to choose somewhere that offers sumptuous rooms, and the features and facilities you’d expect from a luxury hotel. Even though you might have a budget in mind, you can’t put a cost on your wedding venue. You’ll want to make sure that everything is perfect, and that you don’t settle for something you don’t want, in a location you don’t want to be in, and that isn’t right, in order to save money. Traditionally people tend to celebrate their marriages either close to where they live or to where they grew up. That way they have a base from which to arrange the day and even get ready on the morning of the wedding. It also tends to make it easier for guests to attend the wedding, most of whom will probably also live close to the venue. Alternatively, lots of couples opt to get married abroad, where the weather is more reliable and the photographs are almost guaranteed to be in the sunshine. Obviously getting married abroad will change the whole day dramatically in terms of the number of attendees and potentially the time of year you choose to get married – so you’ll need to consider the wedding venue accordingly. The majority of weddings take place in spring and summer, to benefit from a higher chance of sunshine. 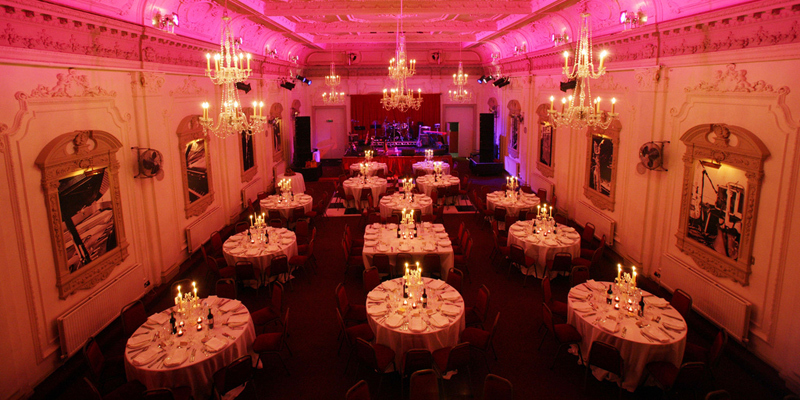 However most venues, from hotels to marquees can be made suitable for winter weddings. In terms of the venue for a winter wedding one of the main considerations will be photo opportunities that won’t freeze the guests half to death. Group photos in summer weddings tend to take place outdoors, so for a winter-friendly alternative you may choose to look for a venue with a dramatic staircase, fireplace or feature wall. 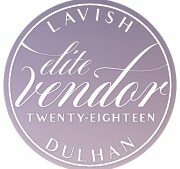 Design Inspiration – As Our centerpiece designs have expanded and evolved, each with their own characteristic as unique as our individual clients. This Bride wanted something Grand ,Unique, Dramatic & Romantic. 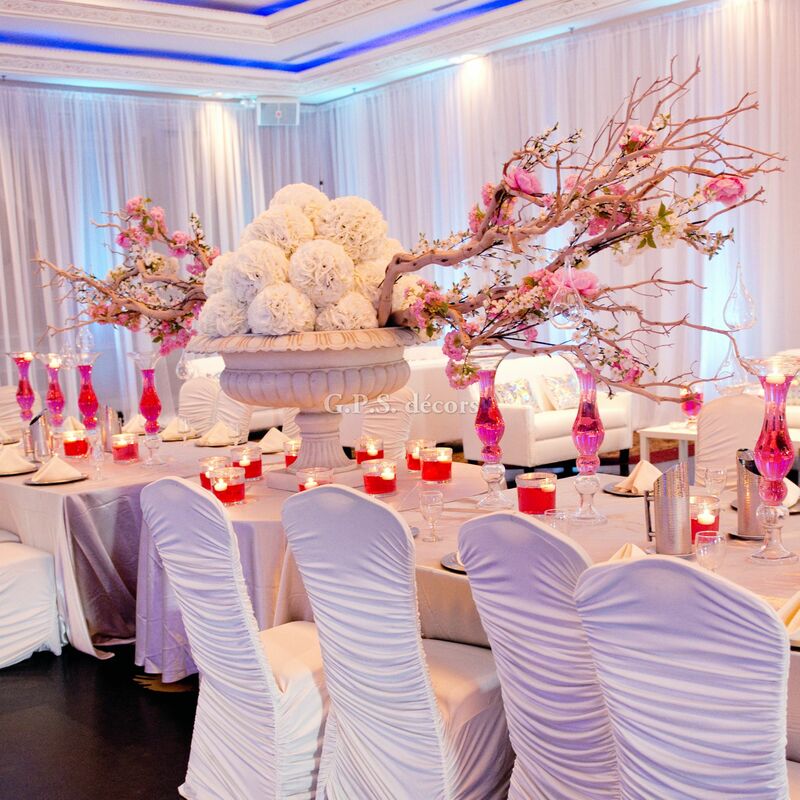 We created drama of Manzanita Tree with the classic elegance of Flower Balls,centrepieces dripping with iridescent crystal candle votives & strands, finished off with pink silk flowers and Glass Cylinder with coloured water & Candles. Design Inspiration – We wanted to create a scheme that encapsulated sophisticated glamour for Bride & Groom with a modern take on “decor”. Wedding Decorations should be anything but cliché and never generic. 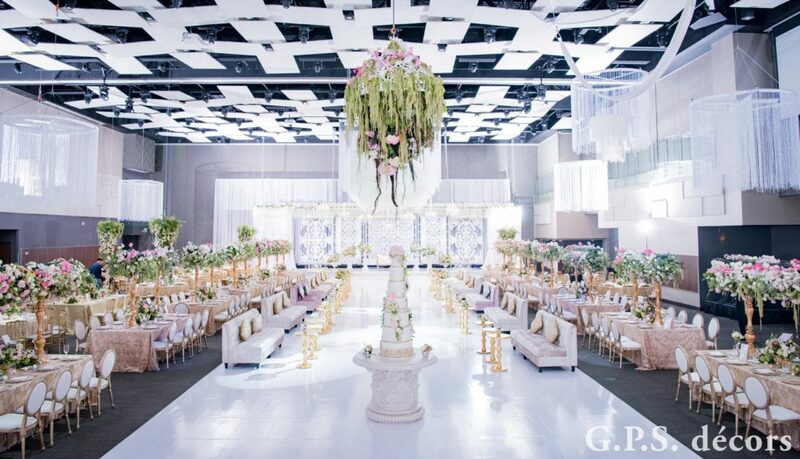 Luckily this season’s trending weddings allow for a playful interchange so you can mix-and-match to suit your taste in a way that gives each detail a bit of it’s own spotlight, while leaving the overall feeling of the space and the event itself with a much needed continuity. In Mississauga, Brampton and Toronto, G.P.S. Decors is dedicated to creating and customizing the wedding decorations and details for you and yours that will make your event stand out from the crowd and give you years of memories to cherish. 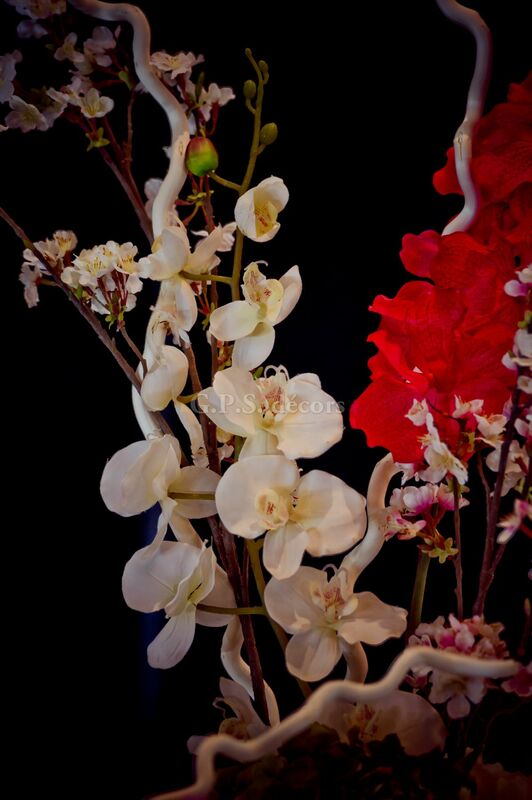 Make your wedding, “The Wedding” and choose us to take care of it all, for you. At GPS Decors we know that this doesn’t always happen. The best defense against the inevitable hiccup is being agile and staying focused on that big day by not letting it get lost in the details. Because this is so important, you need to keep your options open, and have help finding ways to replace one piece with another, seamlessly, so no one is the wiser. Except perhaps for you. This week we’d like to show you how multiple trends can be used to support one another and increase the feeling of a singular and very special day. 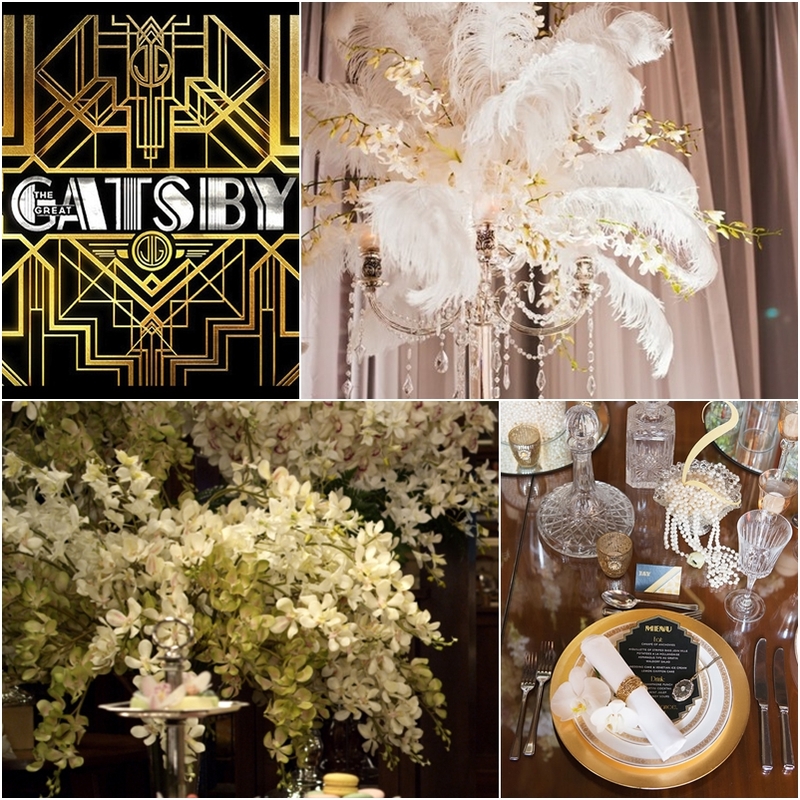 Deco-Chic wedding decorations can be incorporated throughout the event, from attire to décor the old-school glamour of the 1920’s will lend itself readily to the the wedding or the reception. For the fashion-conscious bride there a myriad options and styles to borrow from and blend. From Coco Chanel’s daring emancipation of women’s fashion broadening the options for period dress, to the Roaring 20s hairstyles including the bob cut, the Eton and Marcel wave; moreover, unique hats, headbands and flapper dresses with sparkling fringes and risque lines can give a sense of relevant high-fashion while ultimately making everyone feel and look their most beautiful. Men’s fashions for this period are not only still en vogue but can be seen everyday from the office to the red-carpet. Single-breast two and three button jackets in solid or pin-stripes with double-breasted vests of varied colors and fabrics give the groom a chance to color-coordinate with his bride while remaining solidly formal and of course, not stealing the spotlight. Paired with a narrow, cuffed trouser, it gives slim tailored but masculine lines to any groomsmen and the option of satin accents down the leg to match satin lapels can make any simple color-scheme shine just that much more. Vintage Furniture is not only lovely for guest photos and lounge areas but can be set up before the ceremony to give wedding-party a place to relax and then be re-appropriated for the reception area for everyone to enjoy. The inclusion of not only basic decoration but completely furnished spaces give guests a chance to congregate in a more natural setting where groups of twos and threes can sit close together during and after the festivities without the confines of the more traditional reception tables. This extra touch will show just how much thought and time you put into not only your own experience, but that of those you invite to the most important day of your life. 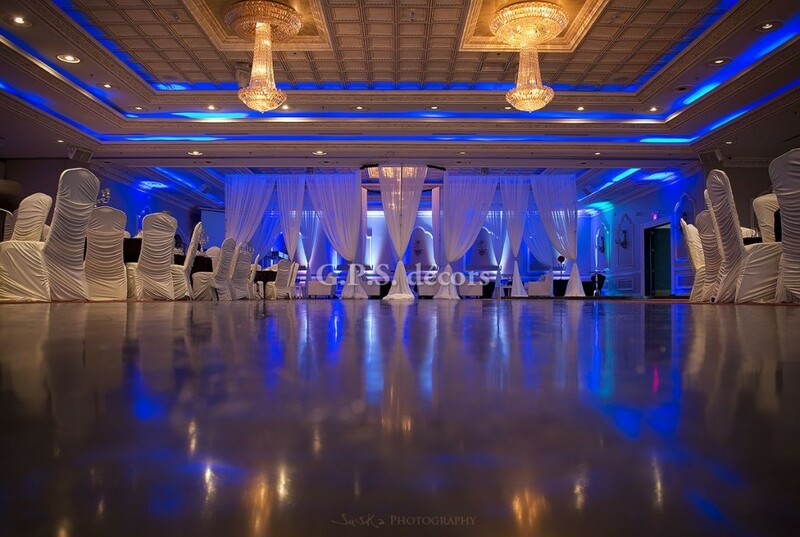 The lighting can also add still more class to any reception or ceremony by adapting lamps with vintage shades, oil-burning glass bulbed or torchiere-type floor lamps with beautiful colored and frosted antique glass and ceramic shades, all which cast light that flows out warmly, giving light and shadow-play throughout the space. Today we’re going to continue our little chat about those all-important people, your wedding guests. 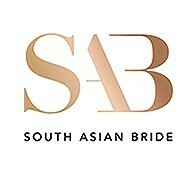 Ealier we talked about the difference between large and small wedding and the potential pitfalls and the advantages. Let’s get to it, shall we? As we continue to look at the scope of weddings as an abstract, we often see that there is huge difference in what some people find appealing. There are those who are almost secretive with their love because to them it is an intimate thing to be kept safe and personal. To others it is cause for celebration and only the loftiest circumstances will do in which they have the opportunity to make the grand gesture, including everyone about them in their shared feeling. So whatever you pick, big or small, intimate or colossal – you now have to decide where you want your nuptials to fall on an entirely different scale. The Casual to Formal Scale. So what do we mean by casual. Jeans and a t-shirt? No, not really. Casual speaks to the feeling of the space and specific ceremony – this includes décor, attire and even your choices in meals and venue. Outdoor weddings can support a lighthearted friendly ceremony and a raucous after-party full of irreverent laughter in a informal atmosphere. Likewise indoor weddings, held in a family home perhaps, bring your guests into a familiar setting where they are free to unwind, relax and have earnest exchanges which foster that optimistic simplicity of new love and life. Casual doesn’t just mean informal, a casual elegance can give the understated larger weddings the feeling of intimacy they might otherwise lack. Are you or your partner the serious type? A jet-setter or socialite? 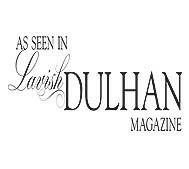 Are you all-in for that classic event with limousine reception, valet parking and contemporary formal-wear? Nobody says you can’t go big and hold on to that stately feeling. Just remember that the more extravagant your scale the more difficult it will be to manage that feeling of significance and splendor. Likewise, when you decide upon the formal feel for a smaller gathering, you have the chance to give the night an alchemical, nuanced exclusivity. To recap our last two installments: Always try to take into account the specific people who you are inviting. If your guests are of limited means and you can’t be sure they have something to don for the occasion, maybe leaning toward an intimate but casual wedding will work best so that everyone enjoys themselves and no embarrassments occur. If you everyone on your list is well on means and there is a lot of them, go big and go formal so you have the opportunity to awe the crowd with every trapping of excess and luxury you can lavish upon them to honor your guests. Sit back and try to experience the wedding from their perspective. Does your event seem pompous when what you wanted was something distinguished? Did you end up confused and overwhelmed by everything going on around you, when your desire was for a focused and magical evening full of intricate ritual? Spend the extra time looking at everything from the perspective of a guest and they, your guests, will thank you. Today’s installment is going to deal with everyone else! We know it’s all about you sweetheart, but hey, other people are coming too! They’re called guests. They might be friends and colleagues or just family. But that’s really what today’s topic is all about. What is the atmosphere you want to create when seen from the perspective of those invited, not just yourself. If you’re unsure of how to answer this question, lets look at the overall scope of weddings in general which might help you out just a bit. Lets look at size of wedding first. Think of the size of your wedding as an expression of not only your number of guests or the capacity of venue but of how public you want your wedding or how private. On one end of the spectrum is the intimate wedding. A ceremony where the inner-circle, many who already know one another and close relatives are invited, and not very many others. These are often followed by a more public reception which can fall on that or another day so you don’t get heat from the friends you didn’t invite. These type of weddings can be modest for religious reasons or just for the sake of reverence for the bond you share. We can count of these types of weddings to be cozy, close and comfortable for everyone involved. They can also be kept smaller if either the bride or groom feels overwhelmed by the idea of a larger service. On the other hand, and far down the other side of our spectrum we have the truly grandiose weddings that make a point of inviting every single person you’ve ever met, seen or spoken to since grade one. These civic events are a proclamation of your love and can be a stage for a formal public gesture showing the world how momentous the prospect of a life together really feels for both of you. You never have to worry about those in your life feeling excluded but you also have some sore feet to look forward to if you plan on chatting with each and every guest. Don’t sacrifice quality time with loved-ones for opulence or pomp. With G.P.S. Decors behind you, whatever the choice you make, big or small, there will be someone with the experience and the dedication to making your perfect day a success by the strictest definition, yours. In Brampton, Mississauga and Greater Toronto, G.P.S. 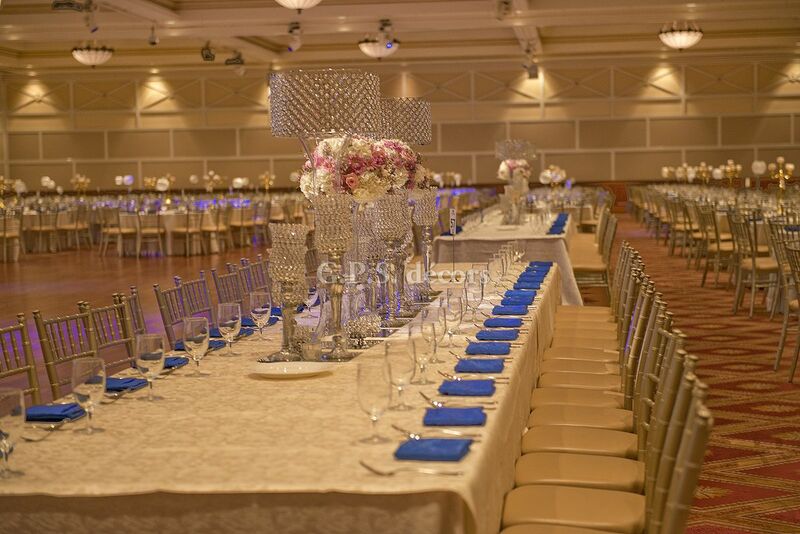 Decors takes the time to show you how to best implement your vision and create a wedding or event which you and yours will really cherish for the rest of your lives.